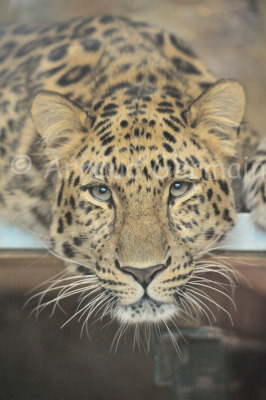 I took this picture of Davidoff, the Amur or Siberian Leopard when he was resting on his platform in his indoor enclosure, at Twycross Zoo. He is not actually looking at me: there was a squirrel behind me on the floor. Shooting through glass in never easy: I put my 150-500mm right against it, used the Optical Stabiliser, moved up the ISO as there was not a lot light to work with and handheld the camera. Amur Leopards are amongst my favourite animals but are incredibly endangered: only about 30 individuals survive in Siberia in the wild!